"The independent liberal arts colleges stand as a bulwark against bigness and sameness in education." A native of Bayonne, New Jersey, Edwin D. Etherington was born on December 25, 1924. He graduated from Wesleyan in 1948 after serving in the U.S. Army during World War II and then received a law degree from Yale University. In 1962, he was chosen as the chief executive of the American Stock Exchange, the youngest person ever to be so elected. When he was named president of Wesleyan during a tumultuous time in United States history, he sought to bring changes to the university. He re-established coeducation, directed that enrollment of students of color be increased, and began a major revision of the curriculum. Etherington led the drive to create the Center for African American Studies, oversaw the building of the distinctive Center for the Arts, and established a scholarship program for Connecticut community college graduates, the Etherington Community College Scholarship Program, which offers outstanding students from Connecticut community colleges a chance to attend Wesleyan. Etherington believed that students were "our best hope for a correction of the imbalances and distortions of a complicated world" and acted accordingly. He tried to balance the issues of the day, many of which concerned student unrest over the Vietnam War, with academic priorities. Resigning in February 1970 to become a Republican candidate for the United States Senate from Connecticut, Etherington was unsuccessful in this endeavor. 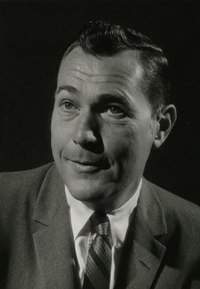 He later became chairman of the Center for Voluntary Action in Washington, D.C., and then of the National Advertising Review Board. A director of several companies, he died on January 8, 2001.